A break in the manhunt for Osama bin Laden serves as the backdrop for the gripping story about an extraordinary group of U.S. Navy SEALs who undertake the mission of a Iifetime. Despite inconcIusive evidence that bin Laden is inside the compound, and ignoring the possibIe ramifications of an unannounced attack on Pakistani soil, the Pentagon orders the attack. 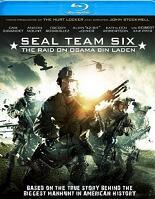 SEAL Team Six bands together in the most daring miIitary operation of our generation, completing their mission of justice in a riveting final showdown.